Did you just arrive in Czech Republic and are wondering where to exchange money in Prague? You will need to withdraw money from an ATM or exchange your currency in Prague as the local currency in Czech Republic is not Euros as in many other European countries but Czech Crowns. The current exchange rate you will get for € 1 is CZK 25. View the daily currency exchange rate from the Czech National Bank here. Follow my article on where to exchange money in Prague if you want to avoid money changers with bad exchange rates and high commissions. My article is going to save you 20% to 45% of your money. Here is a list of 5 money changers in Prague with the best currency exchange. If you want to get the most for your money and not get scammed, these are the places to exchange your money in Prague with 0 % comission and fair rates. If you don’t have a trustworthy money changer at your location but need cash fast, withdrawing money from your debit card might be the best option. Here are a few tips on withdrawing money from an ATM in Prague. Make sure you always convert in the local currency and not in Euros. Even with ATMs from local banks, there might be some foreign currency withdrawal fee however this is mostly less than a bad conversion rate at a non-trustworthy money changer. Prague is visited by millions of tourists every year. Many of the world’s popular currencies are accepted. Many restaurants, bars and fast food chains such as McDonald’s accept Euros. Often you will receive Czech Crowns back for an even better exchange rate than in many money changers. You can use this strategy on the Airport in Prague as there is no honest money changer. If you plan to visit other Czech cities, you should get some Czech Crowns as Euros are usually not accepted outside of Prague. Paying cashless in Prague is easy and convenient. Often you don’t even need to carry cash in your pocket. In most places in Prague, you can pay with your debit card. If you plan to buy some food at some food stalls in the city center or rent a local paddle boat, you will need to withdraw money. There are several Czech banks that will exchange your currency for a much better rate than many money changers. Popular Czech banks are: Česká Spořitelna, Komerční Banka, Fio Banka or Reiffeisen. At some point during your visit in Prague, you will need to exchange money. If you have to exchange your currency at the money changer, always ask in advance about the rate and the commission to avoid further bad surprises. You would be surprised how many tourists don’t check the rates or commissions and get up to 48% less for their money. Unfortunately many money changers in the city center scam people with bad rates or high commissions. I lived in Prague for almost a year and saw many people who fall into their trap. 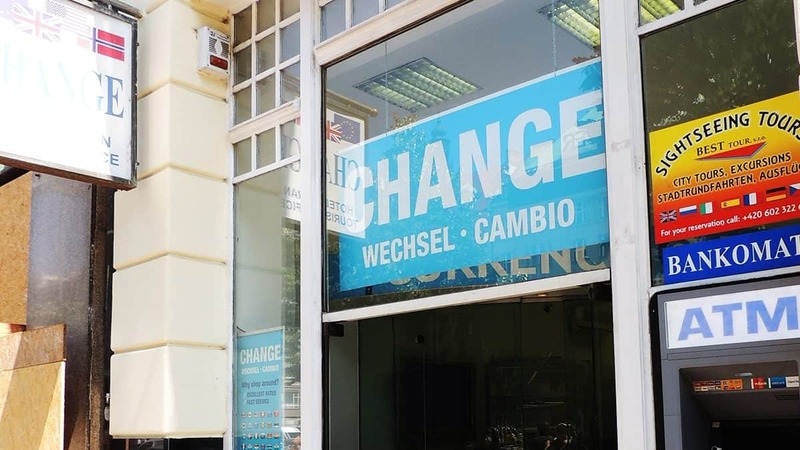 One schady money changer Chequepoint that exchanged money with a 40% lower exchange rate lost their licence in 2018 and shut down their operations in Prague. I would recommend doing some research about the rates and commissions before you decide to exchange money in Prague. After you have exchanged your currency you cannot revert it anymore. During my time in Prague, I have witnessed many travelers that got ripped off while exchanging money in Prague. Use the information in this post to get the best exchange rate for your money in Prague. If you plan to move to Prague and want to get some information about how to find a suitable flat, read the following article. I have also published a tour guide so you can explore the most beautiful places in Prague.